Jill Elizabeth Nelson here to continue our PUGS discussion. Last month we had fun exploring the P-U of the acronym. This month we'll take a peek at the G-S. If you missed last month, you can check back in the archives or just take my word for it--PUGS stands for Punctuation, Usage, Grammar, and Spelling. Whether we are career writers or book readers who make grocery lists, PUGS is one of our favorite elements of writing. However, I'm going to attempt to make the subject at least palatable if not a tad entertaining. Let's make a game of it. If you respond to this post with the answer(s) to at least one of the challenges below, you will be in a drawing for a signed copy of Frame Up, my latest release. The challenges are highlighted in bold print. Here’s an all-too-easy goof that will drive some of readers up the nearest tree—misusing words that have different spellings and meanings, but sound the same. An example of this faux pas that I see more often than I’d like to say is the use of “past” when “passed” is meant, or vice versa. These two words are particularly tricky and interesting because each one can serve as two different parts of speech. The word “past” can be used as a noun or an adjective. The word “passed” can be a verb or a noun. Also, there are more definitions of passed or past that convey further nuances, but these are the main ones. Read the following sentences and either mark them correct or fix them. 1. We past the creamery on the way to the hotel. 2. He should leave ancient history in the passed. 3. Something struck him on the head, and he past out. 4. Jeanine walked right passed him without a glance. Other words that commonly fall victim to usage errors are loose/lose, lay/lie, then/than, affect/effect, who/whom, its/it’s, there/they’re/there and the list could go on a considerable distance. And here's one my husband used this morning in a text to our daughter: "would of", instead of "would have". Go ahead and share any additional grammar errors that bug you. One of the quirks in the spelling department is that British English and American English may correctly spell the same word differently. A Brit might write "colour," while a Yank pens "color." In British English, it would be correct to write "centre," but in America that would get the editorial red ink and be changed to "center." If such niceties aren't enough to addle your brain, English often contains counter-intuitive spellings--in other words, logic would say that a word should be spelled one way, but it's actually spelled another. For example, the word "full" is spelled with two l's, but when "full" is attached to another word, it loses an l, like so: powerful, beautiful, careful, etc. How about the famous "i before e, except after c" rule? Not always! The "c" rule only works for "e/i" combinations that sound like "ee," as in "ceiling." When the "e/i" combination after "c" makes a different sound, the "i" generally goes first. "Science," for instance . . . or "efficient." Boggled yet? Many words don't fit the rules at all, such as "their" and "weird." There really is no short cut to learning the spelling of words, but we can educate ourselves not to repeat errors. 1. A lot is never alot. 2. Nor is alright ever all right. 3. Curiosity is definitely not curiousity. 4. An argument is not an arguement. 5. We bury people in a cemetery, not a cemetary. How about sharing some of your pet misspellings? There are some doozies going around. Remember to include your contact information in your comment on this blog post so I can reach out to you if you are the winner of Frame Up. Stranded in a blinding snowstorm, Laurel Adams must pin her hope of survival on a handsome stranger. The single mother and her teen daughter take refuge in his remote Rocky Mountain cabin. But Laurel's anything but safe when she discovers a dead body in her trunk . . . and becomes the prime suspect in a murder investigation. Her rescuer, millionaire David Greene, knows what it's like to be accused. Three years ago, he was arrested for a crime he didn't commit--an unsolved case that still haunts him. With the clock ticking, can they stop a cold-blooded killer with deadly ties to them both? Award-winning author and writing teacher, Jill Elizabeth Nelson, writes what she likes to read—tales of adventure seasoned with romance, humor, and faith. Jill is a popular speaker for conferences, writers groups, library associations, civic and church groups. She delights to bring the “Ahah! Moment” to students as they make new skills their own. Her bestselling handbook for writers, Rivet Your Readers with Deep Point of View, is available at http://amzn.to/IvQTkj. Visit Jill on the web at: www.jillelizabethnelson.com or look her up on Facebook: https://www.facebook.com/JillElizabethNelson.Author or Twitter: https://twitter.com/#!/JillElizNelson. 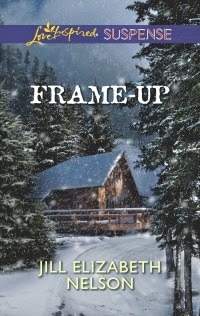 Her most recent release is Frame Up from Love Inspired Romantic Suspense. Her next book, Shake Down, releases in July 2014. One grammar error that comes to mind is you're and your. Thanks for the reminders. It's amazing how easy it is to bypass some of those in our self-editing checks. Lill mentioned a GOOD one, I see that as a common mistake. Another one is: their/they're/there. Great post (so helpful), Jill, thanks for the giveaway! A grammar error that bugs me is when people use the word "funner" or "funnest." Errrgh! Double-errrgh, Dana! That's a doozie! Congratulations, Lill! You are the winner of a signed copy of Frame Up. all right Lill, congrats and enjoy the book!